Just the Facts Check Point Winner! 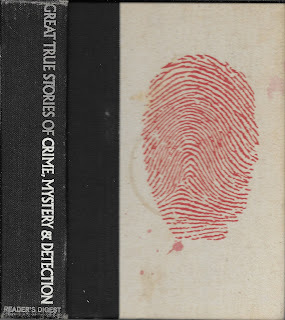 Great True Stories of Crime, Mystery & Detection (1965) is a collection of supposedly factual stories edited by the Reader's Digest Association and written by a variety of authors. It includes accounts of famous crimes and criminals such as the assassination of President Lincoln and the capture of Al Capone as well as lesser-known stories of a murderous Harvard professor, the Great Portuguese Bank-Note Swindle, and the secrets of a Soviet assassin among others. It covers everything from forgery to kidnapping to murder and it also includes tales with supernatural overtones. These "true" stories are told in such an informal, anecdotal manner that it is really difficult to take them seriously. Especially those that involve ghostly goings-on (which apparently fits under the broad mystery category). I also had the feeling that I had read some of these accounts before in books aimed at children--the story about John Wilkes Booth especially brought my elementary school library to mind. Perhaps it's the illustrations found among the stories; because they also remind me of those Alfred Hitchcock collections that I used read when I was young. The writing is very simplistic (far more simplistic than I remembered from Reader's Digest stories) and there is little investigative features to the reports. If someone is looking for bare-bones stories of true crime in very basic language then this is a book for them. ★★ and a half. Even though I don't think I'd personallycount the supernatural tales as true stories of crime, mystery or detection, I am totally counting this as the True Crime entry for the PopSugar Challenge--after all, who am I to argue with Reader's Digest? Raisins & Almonds by Kerry Greenwood. BUT--getting that much reading done during one of my busiest work weeks of the year was a definite win and I want to thank Amanda and Kelly for sponsoring this event and encouraging us to read, read, read! So far I've read five books--two from my original list and then I took a detour through Eve Titus's children's books featuring that great mouse detective, Basil of Baker Street. I've started a sixth book (and third on my proposed list), Angels in the Gloom by Anne Perry. We'll see if I can finish that one before the Bout is over. 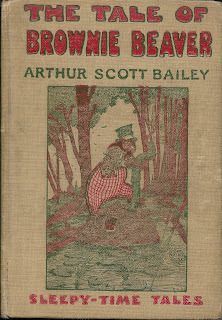 The Tale of Brownie Beaver (1916) is one of a series of classic animal stories by Arthur Scott Bailey. Bailey uses humorous tales of very people-like animals to introduce children to woodland creatures--explaining their habits and behaviors in short, intertwined stories. 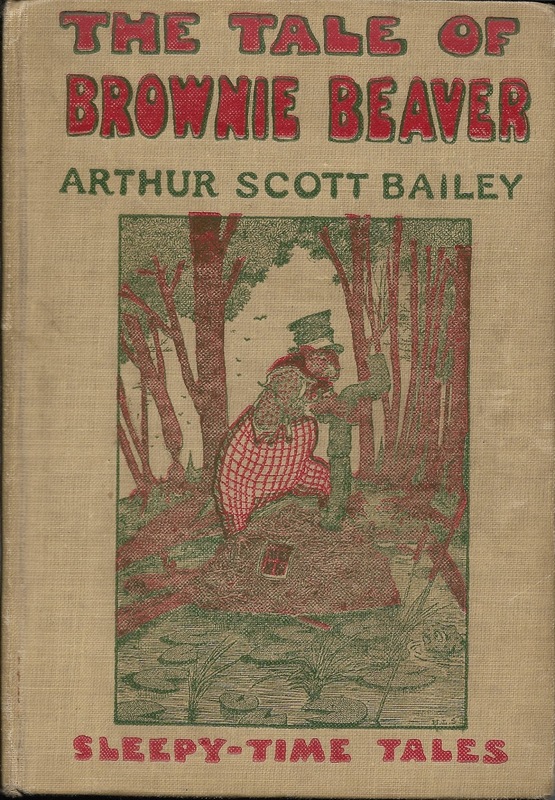 Brownie Beaver is a hard-working mammal who works with his fellow beavers and other animals living in his "village" to build and protect their homes from weather, outsider animals, and men. Children learn how beavers build their dams and lodges, what beavers like to eat, and how they warn one another of danger. When reading the synopsis for Overture to Death (1939) by Ngaio Marsh, one can be excused for thinking that this will be another of her theatrical mysteries. After all, it tells us that a group of seven amateur actors are preparing to put on the play Shop Windows when Rachmaninoff's "Prelude in C Sharp Minor" is set for the overture. Then on opening night the pianist barely gets started--playing three chords and then stepping on soft pedal--before a loud bang is heard and Miss Idris Campanula falls dead against the sheet music. There's no performance and the play setting itself features very little in the plot other than to provide a way for Marsh to insert a rather ingenious method of murder. 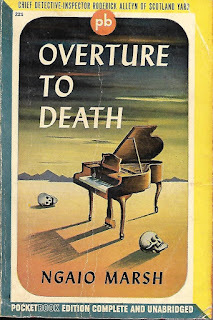 I'm quite sure I'd never come across a deadly piano before I read this one the first time (long ago and far way from our local library). The stars of Marsh's show are Miss Campanula and her bosom friend Miss Eleanor Prentice, two embittered old maids who like nothing more than to spread dreadful rumors about their neighbors and then confess their sins to the handsome rector. Of course, the dear friends are also rivals for the rector's regard--each woman imagining herself to be the front-runner in the "rector's wife" stakes. When Inspector Roderick Alleyn arrives on the scene to decide who gave Miss Campanula such a dramatic death scene, he finds that he must first discover if the murderer has cast the right woman as victim. For until about twenty minutes or so before curtain time, everyone assumed that Miss Prentice would be playing her standard piece as the opening. She is prevented from doing so by an infected finger and only agrees to give up her martyr's determination to play no matter how much it hurt after the rector convinces her. There seems to have been no time for the gun to have been rigged up in the piano after the change in pianists took place--so was Miss Prentice the intended victim? And what was the motive? Do people really kill just because someone is a meddling, gossipy busybody? This was an enjoyable entry in the Alleyn case files. A cast of interesting characters from repressed village spinsters and the handsome cleric to the county squire and the young lovers (whose parents are forbidding the match) to the doctor and his adulterous love interest, the attractive widow; a clever murder method; a heaping helping of red herrings (some provided courtesy of the young scamp George Biggins; and plenty of humor and excellent dialogue. Alleyn does an amusing turn as Holmes and we (blessedly) see little of Nigel Bathgate (I am getting a bit tired of Mr. Bathgate). Great fun even though I remembered who the culprit is. ★★★ and a half. 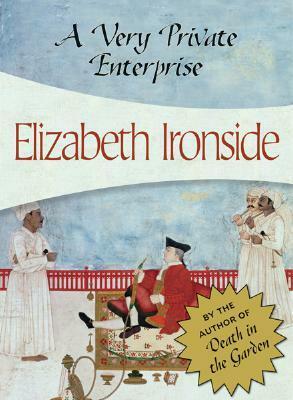 A Very Private Enterprise (1984) by Elizabeth Ironside* was the 1984 winner of the John Creasey Award for a crime fiction debut. It's all about the death of Hugo Frencham, a has-been British civil servant who has landed a position in Delhi where he was destined to spend his days till retirement. Except somebody decided to retire him (permanently) a bit ahead of schedule. He's found stabbed to death in the garden of his diplomatic bungalow--having unaccountably left a party in the British enclave much earlier than normal. Did he have a secret rendezvous that led to his death? Or are there other motives? He was well-known as a collector of Tibetan and other Eastern art and a few recent acquisitions are found to be missing. Did someone have a deadly lust for a silver Buddha? But then George Sinclair, a secret service sleuth sent out from London, discovers a safe full of of gold bars in Hugo's office. Does Hugo's possession of so much (highly illegal!) gold have anything to do with his death? Sinclair works with the local Delhi police and members of the High Commission in Delhi, but it is visiting scholar Janey Somers who helps him find his way through all the red herrings to final solution. Several years ago I discovered Death in the Garden by Elizabeth Ironside. 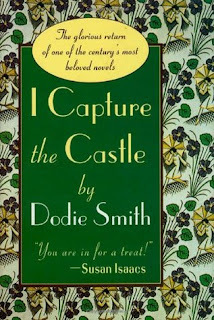 It was an excellent historical mystery that I enjoyed very much (see review linked at the title). When I picked up A Very Private Enterprise, I had the vague idea that it was historical as well--possibly because that cover sortof implies it. It's not really (which--and admittedly this is my own fault for assuming--was disappointing). It is apparently set in the 1970s not long before its publication date, but there isn't anything in the text to definitely date it. In fact, as far as time frame goes, it has a very odd free-fall time period feel. You don't really feel like it takes place in a definite time at all. The way the British people in India behave it's like the British Empire is still going strong. But then it's obvious that India has its own government and police force and whatnot. It's apparent that this takes place before the regular use of computers and cell phones (but not too long) and, yet, the way parties and social interactions are described you could mistake it for pre-1950. In fact, I think this book would have been far better if Ironside had decided to make this a period piece from the days of Empire. I wasn't sold on the procedures of the (then) current investigating officers. It all seemed rather dated if I was supposed to believe that it was the late 1970s/early 1980s. The motive given in the final reveal also seems rather dated. The best part of the book was the character of George Sinclair and his interactions with the various suspects, witnesses, fellow investigators, and, especially, Janey--who, of course, serves as a love interest. The production of red herrings and the road to the final reveal is quite good. 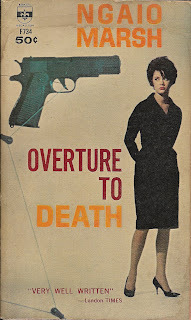 This shows the promise of a good detective fiction writer, but I don't quite see why the book was chosen as the crime fiction debut award winner--unless, of course, all other debuts books that year were real duds (note to self--check out lists for 1984 debut crime fiction novels). A not-quite ★★★ read, but I feel generous and will round up anyway. *Elizabeth Ironside is the pseudonym of Lady Catherine Manning, wife of the British Ambassador to the U.S (2003-2007). I first came to the R.I.P. Event (Readers Imbibing Peril) in 2011 when Carl V over at Stainless Steel Droppings was knee-deep in hosting (working on the sixth year of fall perilous reading). He has since handed over the reins to Heather (aka capricious) and we're set to start a thirteenth round of frightful fall fun. For full details, click on the event link. The main object is to have fun and to share that fun with others while reading books that fall into one of the categories listed below. There are several levels and while it's not a challenge per se, I always set a personal goal so I can add this to my list of "challenges" accepted and completed. I'll be going with my usual Peril the First (read four books that fit the categories). I may also get some viewing in, but we'll see. I don't have a set list yet, but I can say with great confidence that most, if not all, of the books (films) will come from the Mystery category. I'm a big weenie when it comes to horror and thrillers. I will post my list as they come. 1. SPOILER for The Invisible Thief--there are soulless demons involved in the solution of the crime. I'm still working away at my 576-page true crime book (almost done!). It would help read-a-thonning if I didn't have to work and it weren't the beginning of a new academic year here at the university. (Crazy-making!) But--joining in on the Bout of Books has definitely kept me more motivated in reading this week than if I hadn't participated. ~Update at 9 pm. I've finished my first book! Yay! Today's prompt--Literary Villains: Who are your favorite literary bad guys? Here's a top ten list I made quite some time ago. I don't collect favorite villains as a rule, so this list still stands. 1. The White Witch from C. S. Lewis. One of the first baddies that I ran across (unless you count the Big Bad Wolf with the three little pigs or his cousin with Little Red Riding Hood). She was really slick wasn't she? Snaring little boys with Turkish Delight. 2. Professor Moriarty, Sherlock Holmes's arch-nemesis. How could I not list the "Napoleon of Crime"--"the organizer of half that is evil and of nearly all that is undetected in [London]"? 3. The Queen of Hearts in Alice in Wonderland. Gotta love a villain whose best line is "Off with her head!" 4. Big Brother in 1984. Government evil at its worst. 5. But wait, then there's the government that sends out the Firemen in Farenheit 451. A book blogger has GOT to hate those who condone and enforce book burning! 6. Iago in Othello. The ultimate, sneaky, behind-your-back, better-keep-your-eyes-on-him-at-all-times, butter-won't-melt-in-his-mouth, bad guy. 7. Cruella de Ville. Wants to murder puppies for a fur coat. What more need I say? 8. Dorian Gray. Willing to kill just so he won't be criticized by his "conscience" and so he can stay pretty. 9. Mr. Hyde. Letting loose all that's bad and horrible in man. 10. Mrs. Danvers. The original creepy housekeeper. Particularly as played by Judith Anderson in the Hitchcock version. Here I am with my Bout of Books update. 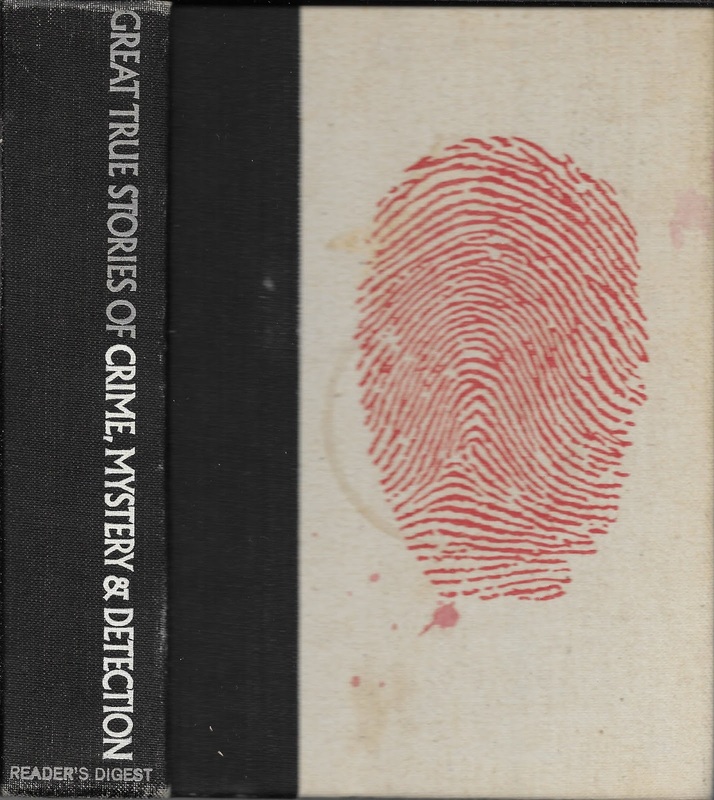 So far I have read 392 pages of my first book, Great True Stories of Crime, Mystery & Detection by various authors; edited by Reader's Digest. This book has 576 pages total and if it's the only book I get done during the read-a-thon, that's still a heck of a lot out of the way. I haven't participated for quite some time, not because I haven't wanted to but because it tends to fall right when I'm busiest at work. And that's true this year too. 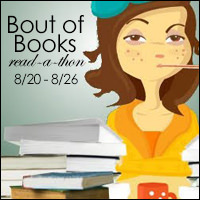 BUT I am woefully behind on the number of books I planned to read this year and I figure a read-a-thon's got to help. Right? Right! So, here goes....I'm officially signing up to see how many books I can knock out this week. Want to join me? As I mentioned in my last review, I have been watching the last episodes of Agatha Christie's Poirot with David Suchet. 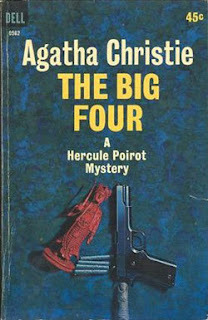 Several of the episodes (I am especially looking at you, The Labours of Hercules and The Big Four) were extraordinarily disappointing--straying far from the original material and making the stories much darker than Christie ever intended. Dead Man's Folly, however, was a more satisfying episode. And after reading the novel again for the first time since junior high school I was pleased to see that it is pretty faithful to the original story. There's a bit of fiddling at the end, but it doesn't change the central plot or the murderer. We still have Mrs. Ariadne Oliver devising clues for a Murder Hunt at the village fete to be held at Nasse Hall. While scoping out the grounds and thinking up clues and red herrings, she gets a sense of evil and believes that murder at Nasse Hall may wind up being not so very fictional after all. 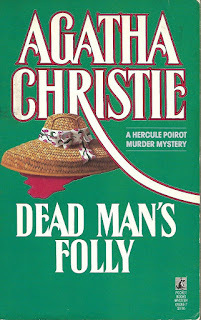 She calls upon her friend Hercule Poirot ostensibly to hand out the prizes for the Murder Hunt, but in actuality to help her discover if something really is amiss. Her intuition proves correct when the Girl Guide who had been cast as the Hunt's victim becomes a victim in reality and the Lady of Nasse Hall disappears from the grounds. Poirot does not immediately spot the killer (in fact, he returns to London, having failed to come up with the answer). But never fear; the little grey cells come through in the end. I enjoyed this every bit as much as I did the first time I read it. The setting is perfect and the characters are distinct, interesting, and a bit exotic and/or eccentric. It was good to visit with Mrs. Oliver again and follow her slightly disjointed ways of thinking and speaking. Her personality is a bit much for the policemen who have to interview her after the murder and it was very amusing to watch their interactions. Stormi at Books, Movies & Reviews! Oh My! 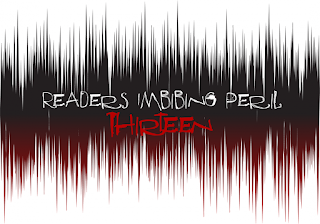 is a mystery and crime novel fan (like yours truly), so she wanted to do a challenge that incorporated all the different types of mystery and crime type novels. When the blog that use to do Cloak and Dagger Challenge gave it up, she decided to take it on and tweak it a bit to make it her own and she also asked Barb from Booker T’s Farm to help cohost it. They've given it another little tweak this year--changed the levels up a bit. I'm all about mystery books, so I'm definitely in for another year of criminal capers. There are several levels to choose from and some basic rules to check out. If you'd like to join the fun, click on the challenge name link above. I signed up for the Sherlock Holmes level (56+books) and have now finished 57 books in the mystery and crime field. I definitely don't have a problem reading the mystery books! Thanks to Stormi and Barb for keeping this one going! Love reading? Love family? Love researching family history? Want a family-friendly reading challenge? Goal: To read a book from the birth year of your selected family members (at least three books). You do not have to mention them by name, unless you want. But do please list the years you'll be reading. You may include yourself in your 'family tree.' For more details, see the sign-up page (link above). 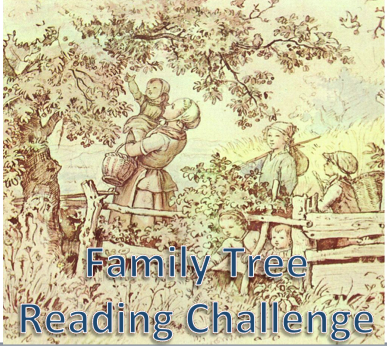 My stated goal was to read at least five books--one for me, my husband and son as well as my mom and dad. I was able to complete that goal with a book for my dad on 8/5/18. This was a fun challenge and I appreciate Becky putting it together. I'm now going to try and finish off books for my dad's side of the family (sister and brother and their kids. The Big Four (1927) by Agatha Christie....or "Christie does Sax Rohmer complete with evil Chinese genius and secret society." Also--Poirot does a Sherlock Holmes on his dear friend Hastings and co. So, yeah. 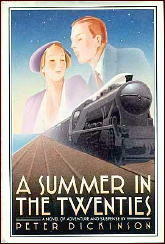 I read this one long ago and far away during my big Agatha Christie binge--from elementary school through junior high. And I thought it was pretty good--of course, I think evil geniuses trying to take over the world have a greater appeal to a younger mindset. And I didn't catch the parallel to Holmes--with Poirot allowing his friends to think he was dead so he could work on catching the criminals. This time around I found myself much less enthralled with Poirot taking on the secret society. 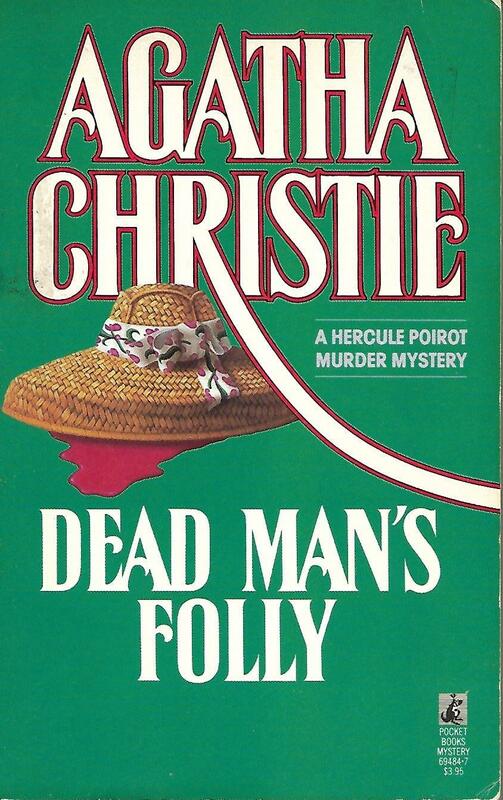 I don't think Christie was at her best when she wrote thrillers, but I enjoy her thrillers more when they are stand-alones rather than inserting Poirot into the mix. There's still an element of fun in watching him track down the elusive Big Four and a bit of humor in the introduction of his brother Achilles. But I certainly can't give it the 3.5 stars my younger self handed out. ★★ and 1/2. This book may not have had as great an appeal to my middle-aged self as it did to the younger me--but it is still WAY better than the Suchet production (keep in mind that I like Suchet as Poirot) and don't even get me started on the production of The Labours of Hercules (though I will talk about that in a minute...). I mean, megalomaniacs who want to take over the world make for good, over-the-top adventure when one is in the mood for it. But to take that and reduce it to the machinations of one guy who is out to impress a girl who rejected him several years ago? Seriously? I'm sorry, but no. Give me the honest to goodness evil geniuses any day. And Labours of Hercules? 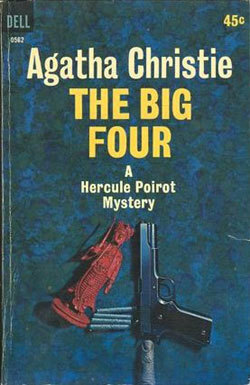 They took an enjoyable series of short stories built around Poirot performing detective tasks in the mode of the tasks performed by Hercules smooshed several of them together (and left out others) to make a horrible mishmash whose point seemed to be to highlight Poirot's overweening pride, and to make the series even darker and more depressing. My little gray cells may not be all that, but even I knew immediately what an astoundingly bad idea it was for the guard to show the woman at the beginning the "secret" knock out in the open with a dozen or so people all around. And Poirot just stands there and watches her do it and didn't think a thing about it. Publisher's Synopsis: When Captain Ridley's shooting partyA" arrived at Bletchley Park in 1939 no-one would have guessed that by 1945 the guests would number nearly 10,000 and that collectively they would have contributed decisively to the Allied war effort. Their role? To decode the Enigma cypher used by the Germans for high-level communications. It is an astonishing story. A melting pot of Oxbridge dons maverick oddballs and more regular citizens worked night and day at Station X, as Bletchley Park was known, to derive intelligence information from German coded messages. Bear in mind that an Enigma machine had a possible 159 million million million different settings and the magnitude of the challenge becomes apparent. That they succeeded, despite military scepticism, supplying information that led to the sinking of the Bismarck, Montgomery's victory in North Africa and the D-Day landings, is testament to an indomitable spirit that wrenched British intelligence into the modern age, as the Second World War segued into the Cold War. Michael Smith constructs his absorbing narrative around the reminiscences of those who worked and played at Bletchley Park, and their stories add a very human colour to their cerebral activity. The code breakers of Station X did not win the war but they undoubtedly shortened it, and the lives saved on both sides stand as their greatest achievement. I'm going to be honest and tell you upfront that the primary reason I read this book was that the title had an "X" in it and I needed that badly for one of my challenges. There just aren't that many titles available from my library that have an X as a word or at the beginning of a word and that sound interesting to me. X-Men and X-Factor graphic novels just don't do that much for me. So, when a search of the library catalog produced this non-fiction account of the code breakers at Bletchley Park, I was thrilled. Especially since the synopsis sounded so interesting. I just wish it had lived up to the synopsis. Not that the workings of Bletchley Park aren't interesting in and of themselves (they are), but Smith tells the story of Station X in such a dry-as-dust way that "their stories [didn't] add a very human colour to their cerebral activity." 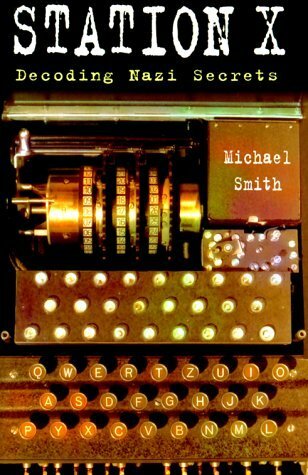 Smith provides a lot (and I do mean A LOT) of detailed explanations on how the Enigma wheels worked and how intricate the codes were and exactly what happened when the code breakers worked on breaking the codes and how rivalries between the various branches of service slowed things down. So much detail reeled off in a "just the facts, ma'am" manner doesn't exactly produce riveting prose. He also tells us just how eccentric and downright weird a lot of these brilliant people were--but he doesn't really give interesting examples to prove it. There just isn't much human color in this story at all--and the quoted bits of stories from those who worked there are such tiny bits that they don't liven the prose up either. This has a very text book feel to it rather than engrossing history. ★★ and 3/4. I Capture the Castle (1948) by Dodie Smith is really the diary of Cassandra Mortmain, a 17-year old girl in 1930s England. She fills three notebooks over the course of six months and tells us about her eccentric family life. The Mortmains live in a dilapidated English castle (with moat and everything! ), barely any money, and barely enough food to continue living. They have come down in life quite a bit since Cassandra's father James Mortmain was the darling of the United States with his first novel Jacob Wrestling. James retreated with his family to the castle when writer's block plagues him. He hoped the atmospheric setting would inspire him. There's been no inspiration for years and Cassandra's sister Rose is desperate to escape their genteel poverty--but how's a girl trapped in a broken-down castle in the back of beyond supposed to meet eligible (rich) young men? No worries...enter the handsome,wealthy, and single young Americans Simon and Neil Cotton who have just inherited nearby Scoatney Hall. 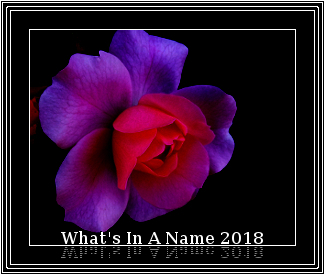 With A Summer in the Twenties I've just finished the What’s In A Name challenge, originally started by Annie, handed to Beth Fish Reads, and now continued by Charlie at The Worm Hole. Thanks to Charlie for sponsoring this. Can't wait till next year! I've got a bit of sympathy for the miners and not much for the owners--after all, I know quite a pack of them--but if we let the unions close the country down and keep it closed for a month, we're done for. Tom is willing to do his bit--after all, it will give him a chance to prove himself since he was just too young for the Great War. He gets more than he bargained for....he winds up involved with Bolsheviks and dockworkers and vigilantes. He takes part in workers' meetings; he starts reading Marx; he is arrested in a police raid (nobly winning the release of unfairly arrested workers); and, though convinced that there is indeed a real Bolshevik menace in Hull, he becomes fond of his new worker friends. . . and more than fond of leading agitator. There is an air of mystery to this seemingly straight-forward bit of fiction. Someone is playing dirty in the ranks and Tom's sense of honor forces him to unearth the one who is playing both sides off of one another and nearly gets himself shot for his trouble. The challenge runs from January 1, 2018 to December 31, 2018. Why? 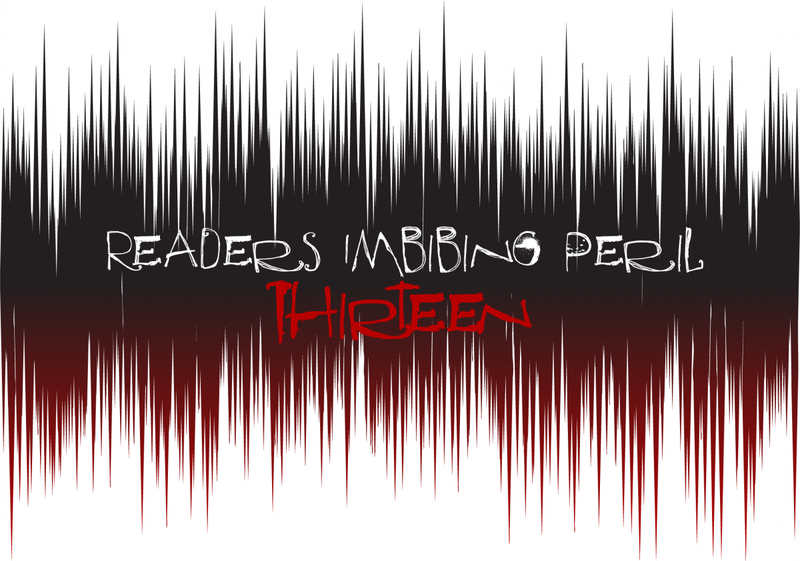 – because it’s fun to read! Read books that fulfill the various categories under the reporter's standard questions. I signed up initially for the Cub Reporter level and completed that in February. I have since been working my way through all the categories to finish as a Pulitzer Prize Winner. Thanks again to Ellie for sponsoring this one!